Our Chancel Choir, under the co-direction of Missy Dustin and Mindy Wolfe, offers an opportunity for those who love to sing. 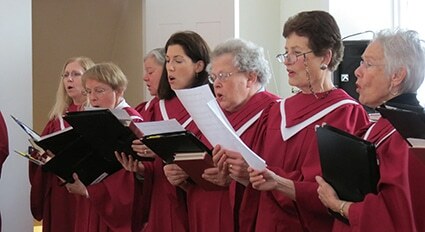 This non-audition choir meets on Wednesdays at 7:30 pm to rehearse and then again on Sundays at 9:00 am, prior to worship. They sing weekly at the Sunday Worship Service from September through June. The Choir is accompanied by organ, piano, clavinova, or sometimes bells! New voices are always welcome. 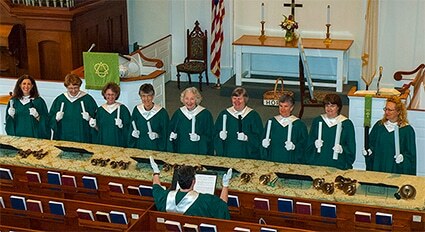 Our Bell Choir, under the direction of Mindy Wolfe, performs on traditional hand bells as well as hand chimes. They rehearse weekly on Tuesdays at 7:00pm, and play once a month at the Sunday Worship Service from September through June. All are welcome to join, whether you’ve played before or want to try it out for the first time! Sacred Dance, under the direction of Heather Oberheim, incorporates dance as a form of worship into our Sunday Worship Service several times a year. Children are often invited to prepare a dance for worship. 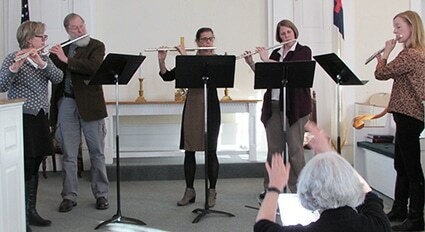 Instrumental music by individuals or groups is frequently part of our services. We have enjoyed flutes, clarinets, trombones, cellos, violins, guitars, and banjos, among others, and we’ve enjoyed a variety of music types, from jazz to bluegrass to African.